Overall Impression: This is a rather straightforward play with less profundity of thought or language than earlier histories. Per Bevington: This was possibly the last play WS wrote, first performed 29 Jun 1613. There was in the 19C controversy as to the authorship, with John Fletcher considered a possible contributor, but a good case can be made for substantial authorship by WS. It was included in the First Folio of 1623. It was once regarded as lacking unity and cohesion, but Bevington disagrees. It deals in part with the controversial subject of the struggle between Catholics and Protestants. There is much courtly celebration, flattering allusions to and compliments for the monarchy, little merriment or bawdry, little contribution by the common people, all perhaps suggesting an increasing influence by [and targeted writing for] the royal court. Above all, it gives and celebrates the remarkable story of the birth of Elizabeth I. The characters that die exemplify the holy art of dying. Characters such as Wolsey go up and down on the Wheel of Fortune--he is serene at the end and exhibits self-discovery through suffering. Depictions of the characters are balanced. The self-effacing Cranmer is associated with the birth of Eliz. I and the victory of Protestantism. Key themes are the uneasy tenure of people in high places, the emergence of a powerful monarchy, the loss of authority by the old nobility (e.g., Buckingham) and the rise to prominence of persons w/o hereditary pretensions such as Cromwell and Wolsey, and the victory of Protestantism over Catholicism and the bitter factionalism accompanying this. Many actual historical events are included. Note: It is helpful to review the history of The Hundred's Year War, for example at the Encyclopedia Britannica website and the lineage of English kings. C.1520. Prologue comes not to make them laugh but to present noble scenes full of state and woe, without bawdry or merriment. London, the royal court. The Duke of Buckingham (former Edward Bohun) & Duke of Norfolk & Lord Abergavenny discuss the recent treaty with France (between Henry VIII and Francis I) at the Field of the Cloth of Gold near Calais, at which time great sartorial excess and costly pomp was displayed to little end, all orchestrated by the ambitious Cardinal Wolsey of York. Buckingham says Wolsey has his finger in every man's pie and that France has already broken the treaty. Norfolk warns Buckingham about Wolsey's malice and power that could be turned against him. Wolsey arrives with others and he and Buckingham are mutually disdainful--Wolsey has been interrogatimg Buckingham's surveyor [household overseer]. Buckingham speaks of his contempt for the cardinal and his awareness that the man is plotting something against him. He plans to go to the king and tell him of the pretentious cardinal's corruption and treason. He believes that Wolsey has conspired with and been bribed by the Holy Roman Emperor Charles V, (the nephew of queen Katharine) to disrupt the recent Anglo-French treaty he Wolsey previously promoted [see contradictory beliefs below in 2.2]. But Brandon and other officers arrive to arrest Buckingham for high treason, and he is taken to the Tower, along with Abergavenny. B. believes his surveyor has been bribed to bear false testimony. London, council chamber. Henry VIII thanks Wolsey for discovering the alleged conspiracy of Buckhiham et al. which he believes was aimed at him. Queen Katharine (Catherine of Aragon) arrives to plead of her husband against some of the actions of Wolsey. Norfolk confirms that the people are enraged by an illegal tax Wolsey has instituted requiring 1/6 of their substance in order to pay for the war in France. Henry is surprised to hear of this and orders the tax to be revoked and pardons for those who refused to pay it. Secretly, Wolsey arranges to receive credit for this revocation. Katharine is sorry that Buckingham has fallen into the king's displeasure. Buckingham's surveyor is brought in, and H8 asks him to tell what he knows about Buckingham. He claims to have heard from B. that if H8 will die w/o issue, he will himself become king; he also claims B. has menaced the cardinal. He justifies his claim to the throne by a prophecy of a Chartreaux friar names Nicholas Henton (or Hopkins). Katharine recalls that the surveyor has lost his job because of complaints and suspects retribution. The surveyor also claims B. said if H8 died, he would be sure Wolsey's and Sir Thomas Lovell's heads were cut off. He also recounts a threat to the life of H8 B. made, in which he would play out with a knife the threat his father (also Duke of Buckingham) made against the then king, Richard III. H8 is convinced B. means to kill him and orders him to stand trial. Royal court. The Lord Chamberlain and Lord (Sir Walter) Sands discuss the lack of benefit to England from the costly treaty ceremony in France. Sir Thomas Lovell arrives to exclaim about the new proclamation that mandates putting aside effeminate French ways and attire. The men exchange laughs about the effects of this on the ladies, etc. They are all invited to Cardinal Wolsey's for a lavish dinner. Westminster, a Hall in York Place. Sir Henry Guildford and Anne Bullen [Boleyn] arrive along with other ladies and gentlemen. He welcomes the guests and promises a merry evening. Lord Chamberlain and Lord Sands arrives plus Lovell, then Cardinal Wolsey. Sands sits by Anne and flirts with her. Wolsey welcomes them all and invites them to drink. After a small cannon fires, the king and others arrive disguised as masquers. Wolsey welcomes them, and H8 sits by Anne and begins to flirt with and admire her. Wolsey identifies H8 and bows before him. H8 asks the Lord Chamberlain who Anne is, and he identifies her as the Viscount Rochford (Sir Thomas Bullen's) daughter, one of Katherine's women. Westminster, a street. Two gentlemen discuss that they have heard that Buckingham has been found guilty of treason and condemned to die. They speak about the noble way in which Buckingham took it all, and that the Cardinal lies behind it. They know the cardinal arranges for any man the king favors to be posted remotely, to keep any competition away from the king. Buckingham enters with Lovell, Sir Nicholas Vaux, Sands, and common people. He gives a gracious speech of farewell and forgives his enemies and Lovell. He recalls the loss his father Henry of Buckingham experienced at the hands of Richard III, and how H7 restored him [i.e., the speaker] to honor and wealth. Both he and his father have fallen by their servant's testimony. The gentlemen are left to lament this noble man's fate. 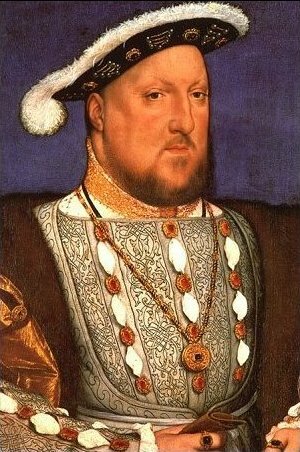 They discuss a rumor of a separation between H8 and Katharine, resulting from some malice hatched by Wolsey against her [he has fostered the belief that, as the former widow of Henry's older brother Prince Arthur, the current marriage is not valid, despite its blessing by papal dispensation]. They believe Wolsey is acting against her to get revenge against her nephew Charles V, who has failed to have him named to the archbishopric of Toledo. Royal court. Lord Chamberlain reads a letter from Norfolk that tells how the cardinal's men have confiscated fine horses intended for Norfolk for the king. Suffolk and Norfolk arrive and they discuss how, regarding his marriage: "It seems the marriage with his brother's wife / Has crept too near his conscience. . . . . No, his conscience / Has crept too near another lady." This has happened because of the cardinal, who is counseling a divorce and secretly hopes to have the king marry the French King's sister, the Duchess of Alençon. They also believe the cardinal has broken the alliance between "us" and the Holy Roman Emperor [this is confusing and seems to contradict statements in 1.1]. Suffolk and Norfolk approach the king, who is angry because of their intrusion. Wolsey and Cardinal Campeius, the representative of the pope regarding the proposed divorce, approach the king, who welcomes them. H8 sends and Norfolk and Suffolk away, and they leave resenting the cardinal. Wolsey praises H8 for submitting his marriage problem to the church for consideration. He claims HRE Charles V, tied by blood to Katharine as her nephew, must accept the conclusions of the holy conclave. Campeius embraces H8. Stephen Gardiner enters--he was Wolsey's secretary [later a powerful member of the king's council and Bishop of Winchester] and now is the king's secretary. He and the king converse privately. Campeius asks Wolsey what happened to the king's former secretary Dr. Pace--Campeius recalls that he was a learned man and warns Wolsey that he is gaining a reputation for sending such worthy men to remote posts. Wolsey claims to have control over Gardiner. H8 has decided to hold the meeting in Blackfriars, a monastic building in London surrendered to the king. Queen's apartments. Anne Bullen and an old lady discuss the lamentable treatment of the queen by the king. Anne insists she would not be a queen, and they chat with bawdy sexual content. Lord Chamberlain enters and announces that H8 has made Anne the Marchioness of Pembroke with an associated annuity. Anne sends her thanks and wonders what obedience she should show in exchange. Chamberlain mentions the "fair conceit" the king has for her, and to himself muses: "I have perused her well; / Beauty and honor in her are so mingled / That they have caught the King. And who knows yet /But from this lady may proceed a gem [Queen Elizabeth I]/ To lighten all this isle?" The old woman is excited at the prospects suggested by the unsought interest the king has taken in Anne, but Anne is faint at the prospects to come. They decide to go and comfort the Queen. Hall in Blackfriars. After a procession, Wolsey leads the inquiry. Katharine kneels before H8 and makes her plea. How has she offended him? She mentions the many children she has borne him (only one of which survives, the future Queen Mary). She asks the proceedings to be deferred until she can hear from her friends in Spain. But Wolsey will not allow a delay. She begins to speak out against Wolsey, says he is her enemy (which he denies), that he is crammed with arrogancy, spleen and pride. She refuses his judgement and demands to appeal to the Pope, then leaves the court. H8 says: "Go thy ways, Kate. / That man i' the world who shall report he has / A better wife, let him in nought be trusted / For speaking false in that. Thou art alone-- / If thy rare qualities, sweet gentleness, / Thy meekness saintlike, wifelike government, / Obeying in commanding, and thy parts / Sovereign and pious else, could speak thee out-- / The queen of earthly queens.--She's noble born, / And, like her true nobility, she has / Carried herself towards me." Wolsey asks H8 to defend him against her accusations. H8 claims he first had the idea that the marriage might not be valid from the Bishop of Bayonne (the French ambassador) regarding the marriage of his daughter Mary. He has wondered if the deaths of his sons by Katharine might have been a divine judgement on the marriage. He first consulted with Bishop of Lincoln, then with the Archbishop of Canterbury [Thomas Cranmer takes this position eventually but is probably not there yet]. He claims he will stay with Katharine if the council declares the marriages legal. Campeius requests they adjourn since the queen is absent. H8 wonders to himself if the cardinals are trifling with him by so delaying, and looks forward to the return of the supportive Cranmer from his opinion-gathering mission to the Continent. Queen's apartments. Katharine is sad and asks for a song. "Orpheus with his lute" is played. Wolsey and Campeius come to her chambers and insist they want to help her and persuade her to do the right thing. She knows no Englishman can support her side against the king. They ask her to accept the king's protection. She insists she will leave her final judgement to the judge no king can corrupt [i.e., God]. She chastises them further, says H8 has already banished her from the marital bed, she has become old, her virtue finds no friends, she has never been branded with suspicion yet is so rewarded. She refuses to willingly give up her title or make herself guilty by accepting divorce. She laments her fate to her waiting women. Wolsey continues to reassure her as to his noble intentions and Campeius says she wrongs her virtues with her weak women's fears. She finally agrees to accept their counsels. Antechamber to the King's apartments. Norfolk, Suffolk, Surrey and Lord Chamberlain converse. Norfolk urges they unite against Wolsey, to which Suffolk agrees. But Chamberlain warns them of the danger. Norfolk says they have nothing to fear from Wolsey because the king has learned of incriminating info about Wolsey regarding his intentions in the divorce. His letters to the Pope were intercepted by H8, in which he warned that H8 was entangled with Lady Anne Bullen, to whom the king has already married [historically 1533] and has given orders for her coronation. Campeius has stolen away to Rome to act as Wolsey's agent, leaving the divorce proceedings unhandled. In the meantime, Cranmer has returned his opinions from the Continent favoring the divorce. Katharine is to called Princess Dowager and widow to Prince Arthur. Wolsey and his aide Thomas Cromwell enter, not seeing the other men. They discuss the packet that Cromwell has given the king. He is plotting for H8 to marry the Duchess of Alençon and to reject Bullen [he apparently does not know they have already married]. He ponders to himself the thought that the queen's mistress would become her queen, and wants to snuff out this upstart Lutheran's candle. He also plans to prevent the rise to favor of the heretic Cranmer. The King enters reading papers. They prove to be Wolsey's personal inventory of worldly goods and treasures that Wolsey has amassed and has inadvertently included in his packet. He asks Norfolk to bring the cardinal in, and to himself concludes the cardinal is more focused on worldly matters than spiritual. Wolsey arrives, and H8 carries on an ironic conversation with him about his holy duties and loyalty, etc. He finally shows him the inventory, and Wolsey is aghast to see the mistake he has made. Left alone, he ponders: "Tis so! / This paper has undone me. 'Tis the account / Of all that world of wealth I have drawn together / For mine own ends--indeed, to gain the popedom / And fee my friends in Rome. O negligence, / Fit for a fool to fall by! What cross devil / Made me put this main secret in the packet / I sent the King? Is there no way to cure this? / No new device to beat this from his brains?" He also sees the letter he has written to the pope. He knows "I have touched the highest point of all my greatness, / And, from that full meridian of my glory / I haste now to my setting. I shall fall / Like a bright exhalation in the evening, / And no man see me more." Norfolk returns and demands the great seal from Wolsey, which the king has requested he relinquish. Surrey accuses W. of treason, says his father-in-law Buckingham was executed because of W., W. sent him to Ireland to get rid of him while he had Buck. executed, etc. W. tries to defend himself against these accusations but Surrey (and Suffolk) continue: W. wrote the Pope against H8, he presumed to act as a legate, he carried the great seal into Flanders, he has sent financial support to the Pope for his own advancement, etc. Chamberlain asks the accusers to let up. Suffolk tells W. that he is to forfeit all his goods, lands etc. and to be out of the king's protection [exiled?]. Left alone, W. further laments his downfall: "So farewell to the little good you bear me. / Farewell? A long farewell, to all my greatness! / This is the state of man ..."
Cromwell enters, amazed to have learned of Wolsey's downfall. But W. claims to be happy now: "Never so truly happy, my good Cromwell. / I know myself now, and I feel within me / A peace above all earthly dignities, / A still and quiet conscience. The king has cured me, / I humbly thank His Grace; and from these shoulders, / These ruined pillars, out of pity, taken / A load would sink a navy--too much honour. / O, 'tis a burden, Cromwell, 'tis a burden / Too heavy for a man that hopes for heaven!" Cromwell tells him that Sir Thomas More has been made Lord Chancellor. W. is gracious with this news. He also learns that Cranmer has been installed as Archbishop of Canterbury, and that Anne and H8 have been secretly married  and the coronation is being planned. W. muses that "All my glories in that one woman I have lost forever." W. advises Cromwell to seek out service with the king, who will advance him. He offers some final advice and words of wisdom to Cromwell: "fling away ambition" etc. Street in Westminster. Two gentlemen await the coronation procession and discuss the roles the noblemen will play in it. Katharine has been divorced by the Archbishop of Canterbury (Cranmer) and is now sick at Kimbolton. The regal processional is described in detail. The second gentleman says of (or to) Anne: "Thou hast the sweetest face I ever looked on. / Sir, as I have a soul, she is an angel; / Our king has all the Indies in his arms, / And more and richer, when he strains that lady. / I cannot blame his conscience." A third arrives to describe the coronation. The York Place has been renamed Whitehall since the downfall of Wolsey of York. Gardiner has been made Bishop of Winchester [he is an opponent of Cranmer and to Protestantism]. Cromwell has been made Master of the Jewel House and is in the Privy Council. Kimbolton Castle. Katharine speaks with her usher Griffith. Cardinal Wolsey has died after being arrested by Earl Northumberland. He fell sick and was in an abbey for 3 days before dying. Katharine speaks about him: "So may he rest; his faults lie gently on him!" but goes on to describe his many failings. But Griffith mentions some of the good he did, founding colleges at Ipswich and Oxford, etc. Katharine hopes she will have such a kind chronicler and defender after she dies as Griffith is toward Wolsey, to preserve her honor and memory. She calls for music and goes to sleep. She has a vision of six personages clad in white robes, who hold bay or palm garlands over their heads in succession [meaning?]. She awakens and believes the spirits have promised her eternal happiness. Griffith sees that she is dying. A messenger rudely interrupts them, and Katharine chastises him. Lord Capuchius, a representative from Charles V, enters. He has arrived too late to be of much comfort to her, however. She asks him to deliver a letter from her to H8, asking for virtuous breeding for their daughter Mary, good marriages for her women, and proper wages for her male attendants. She nobly asks him to tell H8 that she blesses him in death and that she was a chaste wife to her grave. The Bishop of Winchester (Gardiner) asks Sir Thomas Lovell what affairs he is conducting at the late hour (1 AM). Lovell says the queen is in labor. Gardiner hopes for the child's survival but wishes the queen were to die. He fears it will not be well until she, Cranmer, and Cromwell all are dead. But Lovell praises the two men named. Gardiner describes Cranmer as a heretic, a pestilence, and says the king has consented to a meeting the next day to discuss the effort to remove him. H8 and Suffolk to themselves discuss the queen, her near-death from childbirth. Denny arrives with Cranmer. H8 tells Lovell and Denny to leave. The humble Cranmer fears for the plot against him, but H8 reassures him he will protect him. H8 warns him his enemies are many, that corrupt knaves have been enlisted to testify against him. He gives him his ring as a sign of his protection. An old lady announces that the queen has given birth to a girl. Near the council chamber. Cranmer is rudely made to wait outside. Doctor Butts is indignant to see the man forced to wait, and shows the king (from above) what is happening. Council chamber. Lord Chancellor (Sir Thomas More) hears from Cromwell the complaint against Cranmer, who is finally admitted. Chancellor says Cranmer has misdemeaned himself and has heretical opinions. Gardiner (Bishop of Winchester) demands his "sudden" reformation. Cranmer calls to confront his accusers, but the councilmen will not allow this. Gardiner wants him committed to the Tower. Cranmer knows they seek his undoing. Gardiner accuses him of being a sectary [follower of a heretical Protestant sect], and Cromwell says Gardiner is being too sharp. Gardiner rebukes Cromwell and accuses him of also favoring the new sect. Gardiner threatens their bold response. They order Cranmer to the Tower, but he shows the king's ring. Suffolk realizes their plans to purge Cranmer have gotten them in trouble. Cromwell tells them "Ye blew the fire the burns ye." H8 enters, frowning. He repulses Gardiner's flattery and challenges them to make any more accusations against Cranmer. He rebukes them for making Cranmer wait outside. He calls for them to all embrace Cranmer, and he wants Cranmer to come and baptize his new daughter. Palace yard. Porter and his man talk about the procession from the christening ceremony and a crowd gathers... The procession arrives. Royal court. Garter announces long life to Princess of England, Elizabeth. H8 enters and asks Cranmer for her name: Elizabeth he is told. King blesses her with a kiss. Cranmer gives an extended prophecy of the great things that lie ahead for her: "This royal infant--heaven still move about her!-- / Though in her cradle, yet now promises / Upon this land a thousand thousand blessings, / Which time shall bring to ripeness. She shall be-- / But few now living can behold that goodness-- / A pattern to all princes living with her, / And all that shall succeed..." From her ashes will rise another heir [James I]. She will be "yet a virgin, a most unspotted lily shall she pass to the ground..." H8 is very pleased with this "oracle of comfort" and declares a holiday. Prologue fears they have awakened some with their trumpets... He advises the men not to hold back if their ladies clap.